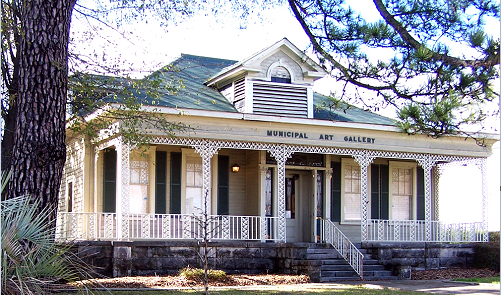 The Municipal Art Gallery strives to both promote and encourage contemporary artists and to create a place where everyone can enjoy American and Mississippi art for what it is: a true reflection of our people and our lifestyles. The goal at the Gallery is to provide a place where artists can exhibit their work and to be a stepping stone for emerging artists. The Gallery, originally built in the 1860’s as the stately home of John and Sarah Ligon, stands today as one of the oldest surviving historical structures in Jackson. As the Municipal Art Gallery, it has become a cultural focal point for local artists and attracts 20,000 visitors to the downtown area every year. The permanent art collection includes art works by Karl and Mildred Wolfe, Andrew Bucci, William Hollingsworth, and Marie Hull, to name a few. Different visiting art exhibits are displayed each month. Contact the Art Gallery for the exhibit on display during any given month.